It is Christmas Eve, 1889. Records don’t indicate whether or not there was snow on the ground, but historical documents make it clear that there was excitement in the air. This would be the first year that St. John the Baptist Church parishioners would celebrate Midnight Mass with their very first resident pastor—Father Durand —and with music from a brand new organ played by Mary Downey (nee Anderton). Father Durand would lead his congregation until 1898 and Downey would lead the choir as the church organist for the next 30 years. For the next 100 years, St. John the Baptist Church was a hub of social and cultural activity for the Comox Valley. For the past two decades… not so much! This historical landmark located on what is now the corner of Comox Avenue and Alpine Street wasn’t always red—it used to be white—and the structure that stands today isn’t the original one. The first church was erected in 1885 and consecrated (dedicated to a sacred purpose) in 1886. It was built on land donated by the Murphy family and constructed by William Anderton and his son John, with generous financial contributions from Michael Donahue, Joe Rodello and many parishioners. In 1887, two tall fir trees crashed down on the church during a fierce windstorm—essentially crushing it and cutting it in half. Needless to say, this was a major blow to the community. But, the pioneers of the Comox Valley took it in stride. In 1888, St. John the Baptist Church was reconstructed and subsequently consecrated again. As was common at the time, the building was built with pegs, not nails. More than 100 years later, this would prove to be a formidable problem as the construction technique—made fragile with time—made it impossible to move the building when its future was threatened. Fast forward to 2010, and St. John the Baptist Church is essentially in lock down. While the attached community hall was still being rented on an occasional basis, the church was in a state of disrepair. It needed extensive structural preservation, electrical work, heating, plumbing and more. There was a massive rat’s nest in a small room that was once the confessional. And amongst the rat’s nesting materials was a foot-high green ‘Jesus Saves’ piggy bank. While still owned by the Roman Catholic Church, newspaper archives from the new Millennium chronicle that the property and its buildings were the subject of heated debate. The church had been declared a historic site in 1986 and there was considerable controversy about its future. Some people desired to see it saved. Others demanded it be demolished. The Roman Catholic Church needed it sold. And Comox Town Council simply wanted the case closed. It was in the spring of 2010 that Kelly Pound, a young artist from Alberta, moved to the Comox Valley with her then 12-year-old daughter. She had no preconceived notions about becoming the driving force behind the resurrection of any local landmarks. History just unfolded. In the past, Pound had purchased and extensively renovated five properties on her own, so she was certainly no stranger to hard work and the challenges of extensive Do-it-Yourself projects. And, as an artist, she has no trouble with creativity. The property included about an acre of land as well as the historic church, with the attached community hall that had been added in the 1970s, and a 2,500-square-foot, two-story home that was once the rectory. It was zoned for ‘public assembly’ as a church, which limited its use for other purposes. So, before she could put in a bid to buy it, Pound got busy trying to get the zoning changed to increase capacity, expand use, and allow for food services and liquor licenses. With a clear vision to breathe life back into what would soon be re-named the ‘Little Red Church,’ Pound submitted the first of what would be many applications to the Town of Comox for re-zoning. While Council was a little hesitant at first, they welcomed the idea of turning the facility into an arts centre, but all in all, the process still took more than six months. Pound, however, was patient, because she knew she had the Town councilors on her side. Once approval was granted in May 2012, Pound put in an offer to purchase. She became the proud new owner of the St. John the Baptist Church—and all its land and infrastructures—in June, 2012. Over the past 18 months, Pound has proven that she’s not afraid of a little—or a lot—of hard work and that she is into this project for the long haul. Her first renovation project was to take the interior décor of the rectory house from the 1970s to present day. This involved ripping out all of the carpets and putting in laminate flooring, interior painting, new window coverings and more. “I had initially intended to clean up the house and move into it myself but, as I talked to people in the community, I realized that there was a demand for small workshop and meeting spaces. I had another vision!” says Pound with a smile. It wasn’t long before the rectory was redecorated and renamed the ‘Little Red Church Healing Centre.’ The four former bedrooms are now transformed into beautifully decorated and fully furnished private meeting rooms. The large living room and the 15×25-foot rec room are used as larger workshop spaces. The kitchen on the upper level and the laundry room/kitchen area on the main level, as well as bathrooms on both levels, add value to anyone wanting to rent space. Before long, a variety of alternative health-related practitioners, community groups and more were booking space. In an average week the Healing Centre may be booked for such things as yoga and art classes, Mystic Valley Voices choir practices, Celtic Club meetings, a photography studio, workshop space and more. Pound began tackling the Church Hall renovations in October 2012. Her first undertaking was to remove the suspended ceiling that masked an impressive vaulted ceiling and to rip down damaged wood paneling from around the perimeter of the room. The tear down would take three months because progress was hindered by the fact that hall was still being rented by a local church for their weekly worship. Each week the renovations had to stop, Pound had to clean up the space and move the pews back into place for the Sunday service. “One week, I forgot to wipe all the dust off the pews and the parishioners all got dusty bottoms!” recalls Pound with a laugh. “I felt terrible about that! It certainly was a crazy, busy time. In order to keep her costs down and to support a commitment to reduce waste, Pound re-used as much of the building materials as possible. The ceiling tiles, for example, were bundled, covered in fabric and remounted on the vaulted ceiling as acoustic panels. Anything that was salvageable, that she couldn’t re-use, was donated to the ReStore. New tracking lighting was installed and the walls were repaired and painted a neutral color. Another month was spent insulating the hall’s attic. Today, the community hall space—now called the Little Red Church Arts Centre—is warm, welcoming and buzzing with activity. The work of local artists is featured on the walls, metal sculptures are dispersed throughout the space and a baby grand piano (on loan from the North Island Festival of Performing Arts) sits on the new stage. Pound’s vision of a putting a community heartbeat back into this gathering space has come true. 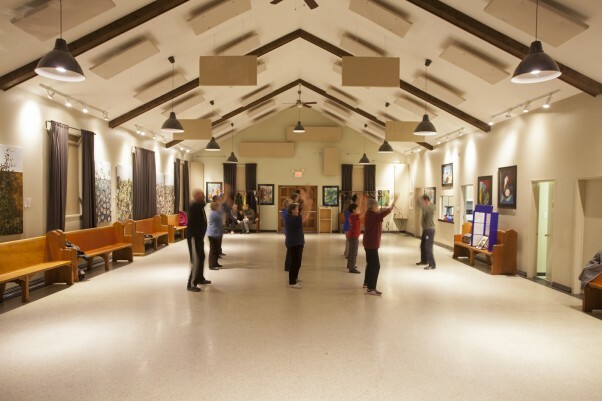 In the past year the Little Red Church Arts Centre has been booked for concerts, theatre and dance performances, Zumba and Tai Chi classes, Girl Guide sleepovers, a celebration of life and more. 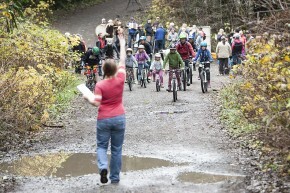 The Little Red Church Community Market, held on the first Sunday of each month, started in October. From the very first event, all 30 tables were sold as local crafters, artisans, food producers and farmers welcomed another opportunity to market their wares. In September, the exterior of the Little Red Church Arts Centre received a facelift. Thanks to Oliver’s Painting and a team of volunteers who simply showed up when they heard the painting project was taking place, the wooden shingles now sport a coat of bright red paint. And, although exterior renos are still a work in progress, progress is being made. News of the Little Red Church facilities being available for rent to local groups and individuals has spread by word-of-mouth, social media, Pound’s website (www.littleredchurchcomox.com) and with the support of the local media. So, Pound will hang up her hammer for most of the winter and focus instead on working with community groups to help promote events and activities in these two new/old community spaces. She will also investigate what government grants may be available to help her begin restoration of the church. She welcomes any support from individuals or businesses in this community who may be able to offer assistance with this rather daunting task. While the church sanctuary ­­­is still ‘off limits’, 124 years since that inaugural Midnight Mass, there is excitement in the air once again as the spirit of Christmas and a celebration of community comes alive at this landmark location. but historical documents make it clear that there was excitement in the air. This would be the first year that St. John the Baptist Church parishioners would celebrate Midnight Mass with their very first resident pastor—Father Durand —and with music from a brand new organ played by Mary Downey (nee Anderton). St. John the Baptist Church was a hub of social and cultural activity for the Comox Valley. For the past two decades… not so much! It is Christmas Eve, try 1889. Records don’t indicate whether or not there was snow on the ground, but historical documents make it clear that there was excitement in the air. This would be the first year that St. John the Baptist Church parishioners would celebrate Midnight Mass with their very first resident pastor—Father Durand —and with music from a brand new organ played by Mary Downey (nee Anderton). Jason Uglanica has a vision; he’d like to help people eat healthy food while supporting local businesses and saving money. 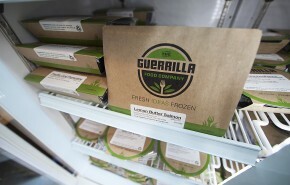 Perhaps it sounds like a hard feat to have all three of these qualities in one meal, but the newly opened Guerilla Food Company is doing exactly what it promises. It offers a contemporary twist to convenient foods by providing wholesome frozen take-out for people on the go at a reasonable price. The value of coming together over a meal has stayed with him, and is part of the experience he hopes to convey when offering these “fresh ideas frozen”. Uglanica grew up as an only child in an RCMP family in Port Hardy and Seymour Narrows where it was remote and rugged. “I was never told I couldn’t do something,” Uglanica says of his childhood, “but rather supported to make up my own mind through conversation.” This drive to do things from his own perspective is part of what has enabled him to create The Guerilla Food Company. When Uglanica was 18 he moved to Vancouver and began working in the film industry. After producing a photography book called This is East Van, which began as a staple book for friends and quickly took off to become a two year project that brought the people of East Vancouver together through photography, Uglanica was faced with a choice. Did he want to create a second book, or did he want to explore his passion of cooking? This same passion for what is real transferred into The Guerilla Food Company. Uglanica had been commuting back and forth between Courtenay and Vancouver for two years before finally deciding to settle here last January. “Constant change and flux is beautiful and awful at the same time, and it wore me out and I needed to come home,” he says. Uglanica stared to cook because he found it was a rewarding way to connect with people and he enjoyed hosting dinner parties in Vancouver. While he had a romantic vision of where he wanted to go in life, it turned out that he wanted to do it by himself. Uglanica smiles. “It all started with perogies,” he says with a laugh. He began to envision a perogi truck that could move with his adventurous spirit to venues wherever they happened to be. The food scene was exploding in Vancouver and a mobile van would combine his desire to work for himself with his love of food. He intended to bring the van home to Courtenay where his family now lives and go from there. Thus began the search for a food truck or trailer. Uglanica spent two years in Vancouver researching the logistics of becoming a mobile food vendor before finally purchasing a vehicle in August of 2012. However, when he received a phone call from the police one night saying that his truck had burned, he accepted the news as a turning point and realized that his heart wasn’t in the venture 100 per cent. So he moved to Courtenay. He began discussing food business concepts with girlfriend Rhonda Meunier and friend Andrew Martin. One night over wine the idea of frozen food came up. They were in the process of researching kitchens and options when an opportunity arose for Martin that took him in a different direction, yet Uglanica found himself still wanting to pursue frozen food. It all fits into the concept that is now The Guerilla Food Company. When the business became a solid idea Uglanica spent three months writing up a business plan and figuring out everything about it. Then he cashed in his life savings, begged and borrowed from family, and was even given a financial gift from a friend who wanted to support his dreams. And it’s good! Walking into the kitchen I am greeted by the warm and savory aromas of what is soon to become take-out Shepherd’s Pie. The huge pots of spiced meat and mashed potatoes will create about 50 packages of frozen take-home dinners. 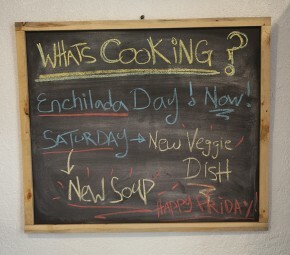 A board in the kitchen lists what else is on the agenda for the day—vegan curry, chicken enchiladas, risotto. I sit down on a sturdy garbage can that also doubles as a stool, and am introduced to Crystal Harrietha, The Guerilla Food Company’s head chef. Harrietha, who used to own Crystal’s Place in Cumberland, brought many attributes when she decided to join Uglanica, including cooking experience, knowledge of how to run a successful business, and a following of people who were familiar with and enjoyed her cooking. “I’m no chef,” claims Uglanica, who has no formal training, but he’s in here helping to cook anyway. If the smells are any indication, then it appears he knows exactly what he’s doing. “What’s the difference between our Shepherd’s Pie and Costco’s?” he asks—“about 50 ingredients. Uglanica believes that by offering whole foods people can get away from worrying about how something in a box may affect one’s health. “I don’t have ingredients I can’t pronounce the name of… and I don’t use processed foods. For example, I leave stock on overnight and boil it down for 12 hours.” So everything in a Guerilla Food Company’s dish comes from real food and is made from scratch right here in their industrial kitchen on Fifth Street in Courtenay. “Locals supporting locals,” he adds. “When its available I will go that route.” But the reality, as Uglanica points out, is that “we like to eat all year-round. Unless we want to eat only root vegetables—or we could have a lot of apple dishes right now!—then we need to source outside the Valley. Yet his mission is to support local farms however he can. This is why even during the off season, Uglanica is conscious of where he gets his food. “It’s the same stuff regardless of where it’s coming from,” he says in regards to his choice to use Mountain View Farms to order produce grown elsewhere instead of the larger distributers. When produce is in season the dishes contain about 30 per cent local ingredients, and the farms or businesses where the produce was sourced is listed right on the label of each take-home package. It is nice to know that my veggie lasagna has squash grown by the farmer I met one week at the market. Another dish currently available is perogies (from his original mobile truck idea), served with kielbasa sausage from local meat producer Gunter Bros, where the meat for all their meals comes from, and sauerkraut made on-site from locally sourced cabbage (both The Birds and The Beans, and Forbidden Fruit Farm). There are also canned jams and jellies for winter gift ideas and a few more of his mother’s “world famous” mincemeat servings available. Nearly all of the labels have listed as a food source Forbidden Fruit Farm, a local farm on Forbidden Plateau Road that has been growing produce for more than seven years. Rod Lane, who owns Forbidden Fruit Farm, is currently growing food exclusively for The Guerilla Food Company. “Everything he has in the ground right now is for me,” says Uglanica. “He wants to grow for us. I want to source from him.” The idea is to support each other so that each company can do what they do best. Part of Uglanica’s long term vision is to enable farmers to do what they set out to do—farm—and to not spend so much of their time washing, transporting and selling their own vegetables.